The first time I tasted lettuce soup was at my cousins' home in Florida. Ruth, who was married to my mother's cousin Tom, served snapper throats and lettuce soup with croutons for lunch one day. Hot lettuce soup? I wasn't sure the flavor of pureed lettuce would be appealing, even with the homemade croutons I'd watched Ruth make, but she was an accomplished cook and I was curious, so I dipped my spoon into the bowl with an open mind. The flavor was subtle and creamy with a bit of a peppery bite in the finish. The crunch of the croutons and the raw silk-like texture of the soup had a very satisfying appeal. A few more spoonfuls. Lettuce soup was an inspiration! More please! When I asked for the recipe, Ruth readily admitted the soup came from a can. Shock and dismay! Soup from a can served with those pricey Gulf snapper throats? Granted, it was some kind of good, but ... canned? Ruth told us the soup was a specialty of Chalet Suzanne, a popular restaurant and inn in Lake Wales, FL, and after so many requests for recipes, a line of canned soups was created with the Chalet Suzanne label. In fact, the romaine soup was so popular that the Apollo 15 and 16 astronauts took it with them into space and it was christened Moon Soup! I was married to a young AF pilot whose palate was sophisticated enough at that time to know that brown was gravy and red was ketchup, so I wasn't sure astronauts were any more capable of knowing good food. Still, I had to trust NASA's scientific expertise to choose the very best for those cream-of-the-crop astronauts, and to know that a little bit of comfort food is a good thing so far from home. Well, of course, I made a beeline for the little market near Ruth's house that sold Chalet Suzanne soups. I have a long history of returning from trips with cans, bags, boxes and bottles of local specialty food! After we finished off those few cans carried home in my luggage, I knew there would be no more Chalet Suzanne soup for me until my next trip to Florida. Dinky little Air Force commissaries, like the one at our NC base, were not likely to carry anything as exotic as soup that had been to the moon. At that time in my culinary life, I only had a handful of cookbooks -- the little Italian cookbook that was the first of my collection, the classic 1970s red-orange Betty Crocker ring binder and The Joy of Cooking. Then one day, an offer arrived in the mail from Book-of-the-Month Club. I was enchanted by the allure of books coming from the outside world directly to my mailbox. Biographies, best-selling novels and ... cookbooks! My order for four free books, along with my promise to purchase two more within the year, was dispatched posthaste! And so the cookbook collection began. Weeks passed before my books arrived. To my way of thinking, there is still something to be said for the build up of excitement that comes with waiting for something in the mail. Don't get me wrong, I love the convenience of supermarkets with racks of best-sellers tempting me at the checkout, and bookstores large and small, and 24/7 Internet stores with overnight delivery, but there was something magical about waiting for a special package via snail mail. 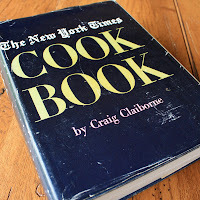 The New York Times Cookbook, published in 1961, was a 700-page collection of over 1500 recipes taken from The New York Times newspaper food columns of Craig Claiborne. The minute it arrived, I sat down to devour it cover to cover. And what did I stumble upon on as I turned the pages? There it was, right on page 70 -- Romaine Lettuce Soup -- with Craig's notes declaring it "a highly creditable soup." As you can see, my copy of the cookbook shows signs of frequent use, especially page 70, with its stains and moisture ripples. My own version of the recipe has evolved through the years. I no longer use the egg yolks and I also go back and forth between using half-n-half in place of the cream, depending on my flexible relationship with fat. Even though I don't miss the egg yolks, I must say, the body and mouth feel of the soup made with heavy cream is ever so much nicer. I've even been known to use a half-cup of each, when I just can't decide, and it is nice too. I love this soup. It makes me think of my cousins and how kind they were to share their home, their beach house on Longboat Key and Ruth's gourmet meals with a couple of young married kids who couldn't afford a "real" vacation. And it makes me remember the thrill I've always found in a new cookbook, a new recipe and sometimes just a can of good soup with an interesting history. Melt butter in large heavy saucepan, add onions and cook until tender. Add chicken broth and bring to a boil. Add romaine and cook over low heat until lettuce is tender - about 10 minutes. Cool lettuce mixture before putting in blender. Put half of the broth and lettuce mixture into blender and process on medium speed until lettuce is finely chopped. Pour into a bowl and repeat with second half of broth and lettuce mixture. Return blended broth mixture to saucepan. Add cream. Season with Tabasco, salt and pepper to taste. Heat soup thoroughly, but do not boil. Serve hot with homemade croutons on top. Makes 10 - 12 servings. Note: This soup is also good refrigerated and served cold. Garnished with julienne romaine lettuce and croutons. Melt butter and oil in a large heavy pan over medium heat. Add bread cubes and sauté until golden brown, tossing to brown on all side. Remove and drain on paper towels. Sprinkle immediately with garlic salt, if desired. Use as garnish to top soups or salads. Store leftovers in an airtight container and use within a day or two. sounds intriguing! but if I make this, I am not telling Steve what it is till we finish eating it! Cora, years ago when I got Marcella Hazan's first book, she had a recipe for escarole soup. In our little town in the south, escarole was nowhere to be found. I have often subbed romaine in that and we love it. I love the story about your soup and will put it on my list of "I need to try!" Thanks for sharing. This is very interesting to me! I have never heard of lettuce soup and am going to try it! I have been making your recipe for years and we love it. I just started the "100" diet, and it was very easy to modify this favorite recipe to the diet without sacrificing the flavor. Thanks for sharing the recipe and your story behind it. Actually Chalet Suzanne soup was made with spinach, romaine is the French translation referring to Roman style. This can be confirmed by a video where the daughter-in-law of the founder explains it. Thanks, Edwin Ostrand! Good to know. And I will extend your teaching moment, if I may. Apparently the confusion for me was searching for a recipe when I could not find the the Chalet Suzanne FL canned soup in my area of NC. Craig Claiborne NYT Cookbook to the rescue - Chalet Suzanne Romaine Soup -- referencing the French term for the Roman-style preparation of spinach soup becomes the discovery of actual Romaine Lettuce soup made with Romaine lettuce. I was delighted with the similar flavors of the recipe Craig Claiborne put in his cookbook, and the easy accessibility of ingredients to make my own homemade version of the delicious Chalet Suzanne canned soup -- with real homemade croutons. So for me, this story, and my part in it, is a perfect example of how foodways develop - sharing foods and recipes within families, churches, schools, through travel, and from distant lands whose citizens immigrate and adapt ingredients, recipes, food traditions, and preparation for a taste of home in a new place create a food that can be traced through many places with localized variations on a recipe theme. Here we have a delicious spinach soup -- served in a famous Florida restaurant, with a "French" recipe, in the "Roman" style, also freeze-dried and sent to the moon, also canned in a factory and sold in markets in Florida, served in FL to visiting family from NC, then back in NC a recipe for a similar version is discovered in a New York Times cookbook, served to friends and family across the country, published here in a food blog and shared with the world. It's spinach "Romaine style"/romaine lettuce soup, a version of which uses available ingredients and exists in many cultures throughout the world (stracciatella, vichyssoise), and even outer space. Now that's a FOODWAY!